An extremeley fine quality Edwardian Chippendale revival mahogany occasional table, stamped 'Maple & Co'. This table has a carved piecrust edge surrounding a superb segmented curl mahogany top. This top is supported by a curl mahogany frieze & underneath,a carved flower motif moulded decoration. This flows into four highly decorative acanthus carved cabriole legs, each terminating at a ball & claw foot. The underneath is again segmented but with straight grain mahogany veneer & has the suppliers label of 'Maple & Co', London, Paris & Buenos Aires. There is also a stamped product number: 924. 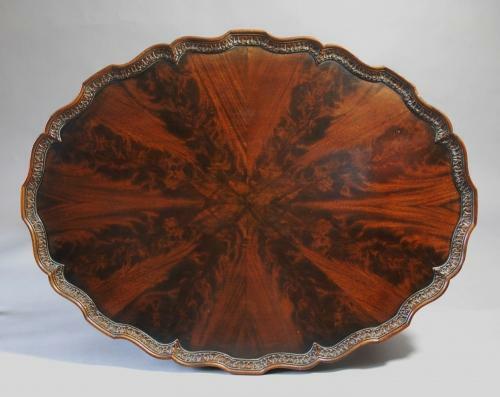 This is a very fine quality & decorative piece which is ideal as a coffee table.